These guys are touch and have caused many deaths every year throughout the world. 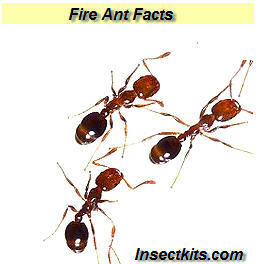 In the USA Fire Ants were introduced sometime in the 1930's. More than 280 of the fire ant species is world wide. These are grouped in a general category based off of the ability to sting and hurt. Ant Origin: The fire ant is found through the world. Venom: Painful to humanns, Feels like fire coursing over the area. Some people are highly allergic. The venom of many fire ants is used as an antibotic as well. Over 25,000 Stinks a year occur that result in mediacl intervention. Food:The fire ant eats insects and plants. The adults bring the food back to the colony as a solid and then the larvae digest what they want and expel the remainder for the adults to eat. Sounds yummy.